--The Pens blow a two-goal lead, lose in overtime, and still gain a share of the division lead, falling 4-3 to New Jersey. --A local group including Robert Morris U. is trying to lure college hockey's Frozen Four to Pittsburgh. It would be the first NCAA championship held in Pittsburgh since the NCAA men's gymnastics finals at Fitzgerald Field House in 1963. And if you don't remember the excitement of the '63 gymnastics finals, then you're just not a Pittsburgh sports fan. --Here's a 12-page document on why the 70s Steelers are still superior to the Patriots. --Today in Terrelle Pryor news: he's probably going to be a Buckeye. 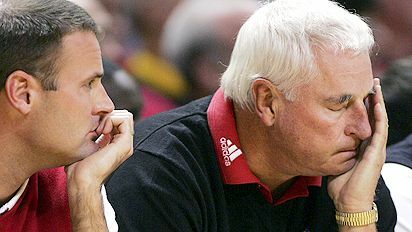 --Good news for courtside chairs who've lived in fear all these years....Bob Knight has resigned from Texas Tech and is probably done with coaching. --Only the Pirates would have this headline for their star player: "Pirates, Sanchez agree to unusual three-year deal". --Is the Bus stopping on Dancing with the Stars? --Here's the first post-Super Bowl mock draft, with the Steelers taking Pitt's Jeff Otah in the first round. --Which postgame interview had a higher squirm quotient: Tiki with the Giants or Bill Belichick with Chris Myers? --Former Stiller assistant coach Mike Mularkey gets the plum job of offensive coordinator in Atlanta. He'll have fun with all of those weapons. --Tom Petty, any explanation for this photo op from your halftime show? The link to the list about the Grammy's doesn't work for some reason.